Prevent tick bites and the spread of Lyme disease with these tips. Every spring, just when the temperatures across New England are warm enough to start hiking, gardening, and camping, we also find that the threat of tick bites and Lyme disease increase. So in perfect timing, the National Pest Management Association has deemed May, Lyme Disease Awareness Month. If you are unaware of the relationship between tick bites and Lyme disease in Maine, New Hampshire, Massachusetts and many other areas across the country, read on to learn more! Largely responsible for the spread of Lyme disease are blacklegged ticks (aka deer ticks). Deer ticks can be recognized by their small size and reddish teardrop shape. They have sucking mouthparts that act as a pump to extract blood from humans, our pets, and many other animals, to receive the nutrients necessary to survive. For females, after a blood meal, she can lay anywhere from 2,000 to 18,000 eggs! If a deer tick is already infected with Lyme disease, they can transmit the bacterial infection to humans and even our pets. The symptoms of Lyme disease often start as flu like symptoms with a headache, chills, fever and fatigue. In some cases, the area surrounding the tick bite will become a bulls eye rash, but not always. If untreated, the symptoms of Lyme disease will become more severe including pain and swelling of the joints, even Bell’s palsy. Try to avoid places that are known to have ticks such as the woods and tall grassy areas. Walk in the middle of trails as opposed to on the sides where the path ends and the woods begin – this is where ticks tend to wait for their host. Apply an insect repellent if you are going to be in areas known to have ticks. Repellents that contain DEET are best in controlling ticks. Wear light colored clothing that covers the entire body. This will make any ticks you do find easily noticeable and by wearing longer layers, ticks have a harder time accessing your skin for a blood meal. Once you get inside, check your body and hair for ticks and take a shower to help any crawling ticks detach from the skin or hair. Keep dogs up to date on their flea and tick treatments to help prevent ticks from getting onto your property and inside your home. Plus, our dogs can get Lyme disease too! To learn more about tick control for your home in Maine, New Hampshire or Massachusetts, please contact Modern Pest Services today. 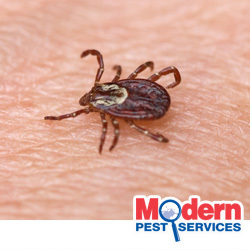 While Lyme disease cases are sure to rise this spring and summer when ticks are most active, now is the time to protect your home and property with Modern’s HomeCare Advantage program which controls 60 pests including those pesky ticks that can potentially transmit Lyme disease. In recognition of Lyme Disease Awareness Month, make sure to share this information with your family and friends!